Pope Francis “takes aim” in “Gaudete et Exsultate”—and misses? “Taking aim at Catholics…”? Granted, it is an exhortation, but Martin’s rather giddy Tweet carried a strong whiff of “giving them what they had coming”. Would (or should) a papal text on holiness really “take aim” at certain Catholics? Meanwhile, in an online piece for America magazine about the “top five takeaways” from the papal text, Martin explained that the first key point is “Holiness means being yourself.” And what if I’m someone who has a “punctilious concern” for the Church’s liturgy and doctrine? What then? Unfortunately, the document also contains more than a few remarks or suggestions that are either puzzling or disconcerting—and not, I think, for the right reasons. The passage quoted by Martin is certainly one of more obvious examples. Yes, there are undoubtedly a few Catholics who fixate on liturgy and doctrine in a way that can be unwise or unhealthy. But how many more Catholics obsess about “tolerance” and “openness” to certain ways of being or living—usually advanced with a lengthy, ever-evolving acronym—in a way and to a degree that is far more obvious and problematic? How many Catholics show little or no concern for liturgy and doctrine, and view “being Catholic” as either some sort of curious birthright or an embarrassing attachment to “recover” from? And how many Catholics obsess—and I don’t use the term loosely or lightly—about being accepted, embraced, and otherwise feted by those in power and in the limelight? All of these descriptives can be parsed in an agreeable fashion, I suppose, but the overall impression is that rules, boundaries, limits, dogma, and tradition are almost always impediments. And yet, for a growing number of people in the West today—especially those who are younger—there is a recognition that the past several decades, which has witnessed full-scale assaults on many “rules and regulations” (and certainly on dogma), bear witness to the fact that some things really should hold fast and must stay put in order for goodness, order, and authentic love to survive, never mind thrive. It is not a matter of applying rules or repeating what was done in the past, since the same solutions are not valid in all circumstances and what was useful in one context may not prove so in another. The discernment of spirits liberates us from rigidity, which has no place before the perennial “today” of the risen Lord. The Spirit alone can penetrate what is obscure and hidden in every situation, and grasp its every nuance, so that the newness of the Gospel can emerge in another light. Very well. Meaning…what? Is it really true that “the same solutions are not valid in all circumstances”? There is a certain cognitive dissonance at work when we are told, on one hand, how the new gnostics and pelagians are bad because they are contrary to “the concrete simplicity of the Gospel” (par 43) and, on the other hand, how they are also rigid and harsh because they cannot appreciate the complexity and uniqueness of a world that cannot be understood in simple, clear terms. If anything, gnosticism can far better be aligned today with movements that emphasize radical individualism, freedom from physical and material limits, ability to construct one’s belief system around one’s circumstances and desires, and places final authority in the hand of the self-created and enlightened creature rather than in the doctrine and person of the One Who is the Way, the Truth, and the Life. These two passages, as Magister logically surmises, appear to be swipes at The Power of Silence and God or Nothing, the two recent best-selling books by Cardinal Robert Sarah. And if you don’t think that’s likely, then I politely suggest you haven’t been really paying attention to what has transpired in over the past five years, because these sort of personal jabs are very much in keeping with Pope Francis’ personality and style. My point, in conclusion, is that while I certainly have benefited in some ways from reading Gaudete et Exsultate, the good qualities and substantive passages in documents and texts such as this are increasingly overshadowed, or even undermined, by the grave tensions and growing conflicts within the Church. Especially since, sadly, Pope Francis and his closest collaborators have not only failed to address those tensions and conflicts, they have played a significant role in exacerbating and deepening them. They do appear to be take pleasure in “taking aim” at Catholics they deem to be too dogmatic, rigid, and focused on liturgy. It is a shame that this has continued in this apostolic exhortation on holiness but it is not, I’m sorry to say, too much of a surprise. 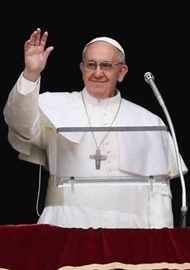 5 Responses to Pope Francis “takes aim” in “Gaudete et Exsultate”—and misses? A lot to absorb here. At first glance it seems there are no solutions or resolve on how to act. Yes, love, but with guidelines. Steps to holiness are not as simple “love”. Must reread it. It’s Amoris Laetitia all over again. 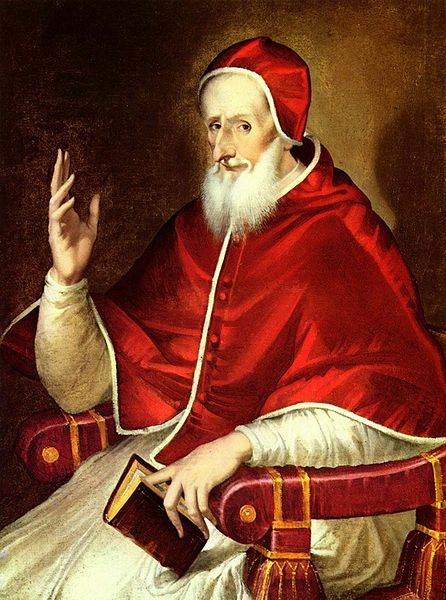 Lots of lengthy repetition of general Catholic teaching (all well and good) with that drop of wheedling in of self-referential Francis pontifications against traditional Catholics! And what is worse, against timeless Catholic teaching on the fundamental importance of silent prayer before God! Yes, what most stands out for me too is how this new exhortation mocks those who hold to the importance of silence and prayer. A genuine slap in the face for contemplative Orders: the roots that sustain the whole Church! Or our great Cardinal Sarah perhaps, as Carl Olson says? 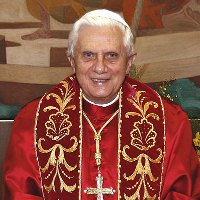 Or Pope Benedict who resiged the Papacy for a life of prayer for the Church? Nothing new to see here (^) in GeE… move along please 😏. Read this quote just now in Kreeft’s book, Socrates Meets Marx: “He who marries the Spirit of the Times will very soon becomes a widower.” This seems to sum up Fr. Martin’s philosophy. Also watched Martin and Ross Douthat debate by America. Interesting exchange. Douthat seemed nervous and shouldn’t have been. Martin blathered on about love and love and giddiness.